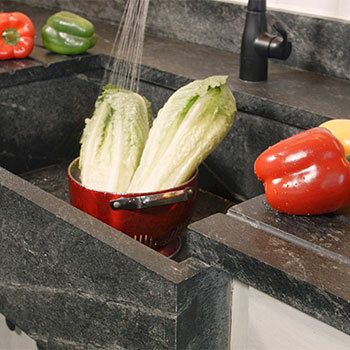 Soapstone: The material of choice for sinks – for centuries. Building custom sinks of Vermont Soapstone is not a new innovation. In fact, custom sinks have been a mainstay for us since our beginning. And for good reason. 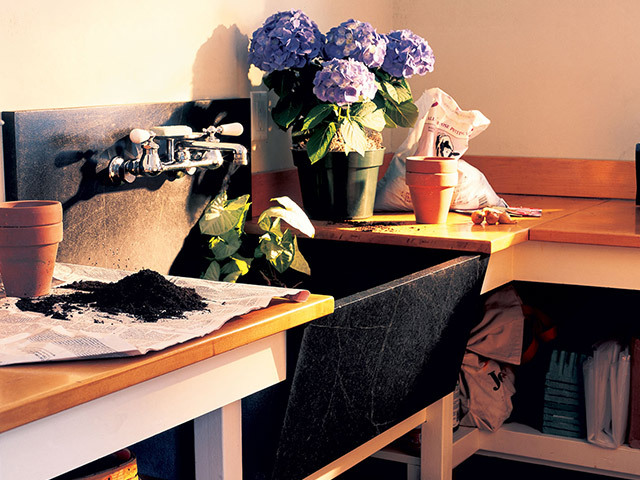 Soapstone is impervious to chemicals, acid and water, making it an ideal material for sinks. Because of this, there’s no reason to limit your thinking to the kitchen or bath, either. We’ve built sinks for butler pantries, laundry rooms, greenhouses, patios… even garages, if you can imagine that. The sink we create for you will be custom made to your specifications. Your sink parts are machined with precision and assembled using our own special blend glue. The drain opening will be located in the exact position you specify, and will accommodate either an ISE garbage disposal or Chicago Specialty Spin and Lock basket strainer. Whatever use you have in mind, you can be assured that the only thing that might surpass the classic look of your Vermont Soapstone sink is its hardworking practicality. The beauty of custom soapstone sinks. Because all Vermont Soapstone sinks are built to order, your imagination can play a big part in the process. Maybe you want two bowls of different widths, each set at a different height, one with a garbage disposal, the other a bar drain. We can do that. And most any other configuration you have in mind. 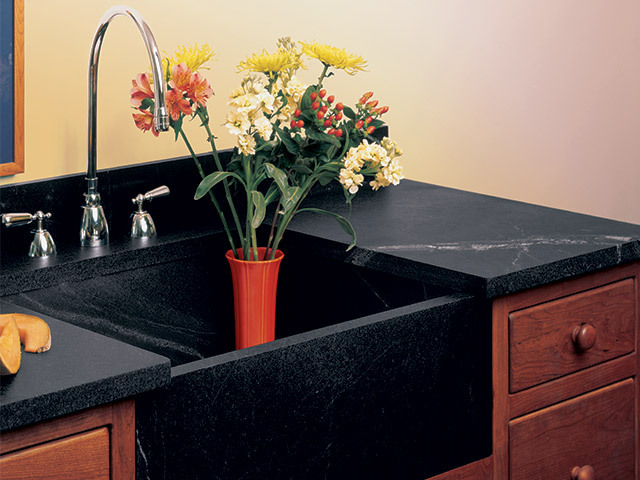 We craft our custom sinks from 1.25″ thick soapstone slabs at our Perkinsville, Vermont mill. But if you’re set on something really different, we can carve your sink from a single block of soapstone. It’ll take a few months to complete, but will be well worth the wait. 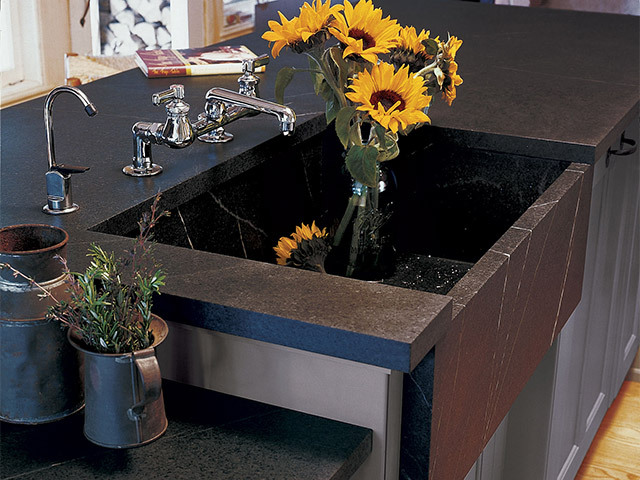 Custom Soapstone Sink Design Tips. Here are a few pointers to keep in mind when considering a custom sink. A sink is always built to its outside dimensions. To determine the interior dimensions, simply subtract 1.25″ (the thickness of the soapstone) from each side and 1.75″ from the bottom. You can have the drain placed anywhere in the sink bottom and still get the required slope for adequate drainage. If you want two or more bowls, think about your uses for them. It might work better to have fewer bowls of larger size than more that end up being too small to suit your needs. A test we use is to cut a piece of cardboard to the length and width of the sink and lay it on the counter. This will give you a visual reference and help you determine your most practical bowl size. Sloped-front sinks are neat. But you do sacrifice some space at the sink bottom. For example, a 20″ sink with a 3″ slope will leave a 17″ bottom. It’s a good idea to make sure your desire for aesthetics doesn’t rob from your need for practicality. When faucets will be deck mounted, think of your plumber. Most cabinets are 24″ deep. A 20″ sink flush with the cabinet face leaves 4″ for the plumbing, which is the minimum amount of space that should be left to avoid causing installation problems for your plumber. 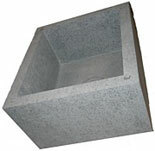 Vermont Soapstone sinks require support from underneath on at least two sides, front and back or left and right. Be creative. Remember, we are building your Vermont Soapstone to your design. Go ahead and make it the sink you’ve always wanted.